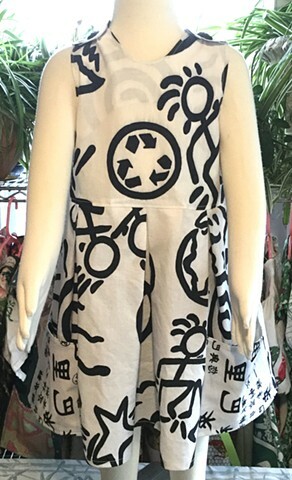 Graphic black and white print, a la Keith Haring, pull-over-the-head dress with full pleated skirt, big pockets in complimentary asian characters print, shoulder buttons, plus side buttons for snugger fit. Size K-1st Grade (5-6 years), measures 24” armpit to armpit, 22” shoulder to hem. $50, washable, 100% cotton, made by the designer herself and shipped free to any address in the U.S.